Today for my Caturday Art project I'm going vintage by applying the Sepia effect to the Petfinder picture that made Mommy fall in love with me. She says I look like I belong in The Wizard of Oz! What do you think? Visit more artsy kitties in Athena's Caturday Art blog hop. 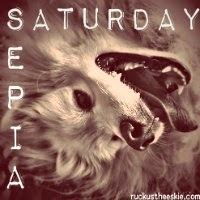 I'm also joining Ruckus the Eskie for Sepia Saturday this weekend. We can definitely see why your Mommy fell in love! Aww, you are a cutie! 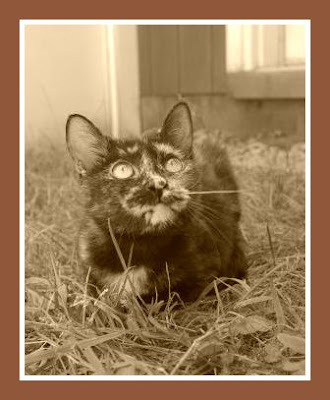 Sepia is so you, Mudpie!! MOL So gorgeous!! I can see why she fell in love- you are so adorable. Oh my goodness, I love it! Mudpie, it's no wonder your mommy fell in love with you. I love sepia and your pretty coloring comes out so well here. I think you're just too cute, Mudpie! Yes, we can see why your Mum said that. Beautiful! We love this artwork of you, sweet Mudpie! Everybuddy in Oz would love you, just like we do! You sure are cute Mudpie. To tell the truth, The Wizard of Oz was before my time. I’ll have to ax TW who may be too #senile to remember. Thanks for joining Ruckus The Eskie and Earl's World! in the Sepia Saturday Blog Hop! Dat's a pawsum foto. Gweat Caturday awrt. Have a pawsum weekend. Oh My Cod! Mudpie, yous so cute that even mes would has falled in loves with yous and bringed yous home! she looks gorgeous in Sepia! OMG!! So cute Mudpie!!! You are simply precious!!! Pop-Up Cat Cafe Coming to Dallas! Make Your Cat a Pin Up Kitty!